One year after graduating from medical school, in 1884, while working in a Berlin mortuary, the Danish scientist Hans Christian Gram developed a stain that permitted him to visualize some but not all bacteria in lung tissue. This simple but major discovery subsequently led to the finding that many bacteria can be differentiated into two broad categories based on the thickness of their cell walls, aiding in the diagnosis and treatment of bacterial infections. Cell walls, found in bacteria, plants, and fungi, but not in animals or protozoa, provide protection and support of the cell, and perhaps most important, prevent bursting if excess water enters the cell. It is the cell wall that traps certain dyes, permitting their bacteria to be visualized. In the Gram stain procedure, Gentian (crystal) violet is poured over a slide containing bacteria and Lugol’s (iodide) solution is added to fix the dye. The slide is then washed with ethanol. Certain bacteria (such as the pneumonia-causing Streptococcus pneumoniae) retain the dye and appear purple; these are Gram-positive bacteria. Other microbes (the typhus- and syphilis-causing bacteria, for example) become decolorized by the alcohol and assume a red or pink color—Gram-negative bacteria. Gram-positive bacteria have thick cell walls and trap the purple stain in their cytoplasm, while Gram-negative bacteria have much thinner cell walls from which the dye is readily washed. The Gram stain is routinely used in medicine as a diagnostic tool to differentiate infections caused by Gram-positive or Gram-negative bacteria and provides a rational basis for the selection of antibiotics. Most antibiotics are preferentially effective against either Gram-positive or Gram-negative bacteria. For example, penicillin combats many Gram-positive bacteria by interfering with their ability to synthesize cell walls that are essential for their survival. (Animal cells lack cell walls and, therefore, penicillin is not toxic to them.) The thick outer membrane of Gram-negative bacteria protects it against the body’s defenses and also impedes the passage of many antibiotics into the cell. The aminoglycosides are a class of antibiotics used for the treatment of these bacteria. SEE ALSO: Germ Theory of Disease (1890), Endotoxins (1892), Antibiotics (1928). 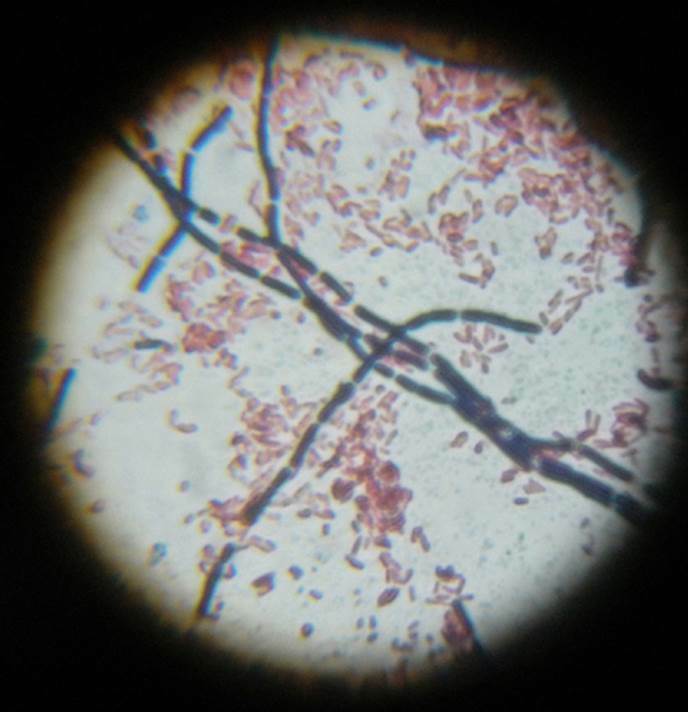 After applying the Gram stain, Gram-positive Bacillus cereus are dyed violet and appear in a series of chains, while Gram-negative Escherichia coli are the small pink clusters in the background.